The Ronnie Scott’s Charitable Foundation is delighted to partner with Wac Arts and help fund both their Junior Wac Arts Music Tuition and the Wac Arts Band programmes for the Academic Year 2018 – 2019. 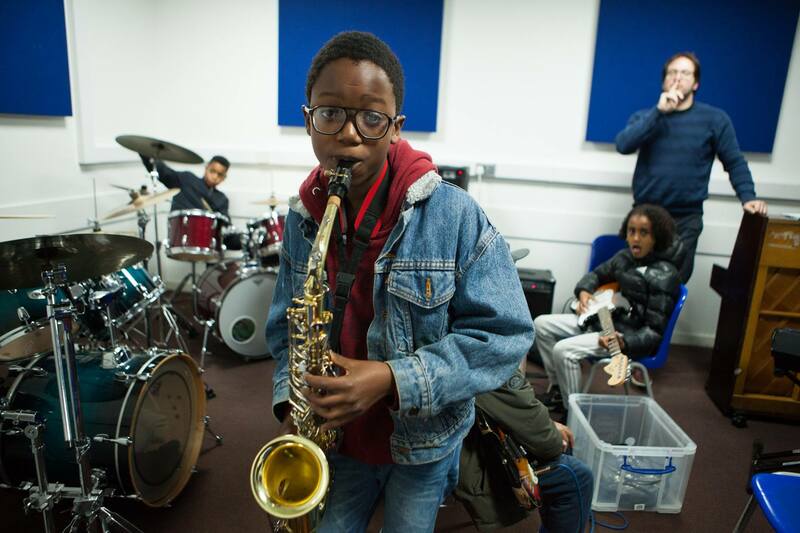 Our grant will go towards the wages of the tutors including saxophone, guitar, keyboard and drum/band leader. Junior Wac Arts Music Tuition provides 1-2-1 and small group music tuition to 70 young people aged 9 – 15, on the drums, keyboard, guitar and saxophone, providing an introduction to learning a musical instrument. They offer 1-2-1 thirty minute lessons, or shared lessons with those at the same level, at an affordable lesson price of £3. Their lessons allow young people to learn at their own pace, their tutors encourage daily practice to maximise the benefits of lesson time. To enable all students to access an instrument they offer a weekly loan scheme for saxophones and guitars. They also offer practise spaces in the evenings by arrangement for those young people learning the drums and keyboard. Wac Arts Band provides three classes engaging 34 young people aged 9-20 to develop their musicianship while working as part of an ensemble. Each class is based on musical ability and aptitude rather than age. The ensemble style of playing means that students work as a team to explore a range of different musical styles and genres and are encouraged to develop a broad range of group and solo musical skills including improvisation and directing. The three classes provide a safe and supportive environment for young people to have opportunities to play and experiment with their chosen instrument, and an opportunity to trial new ones, alongside their peers. Wac Arts hold sharing’s at the end of term, as well as annual performances as part of their spring festival. ‘It’s great to see all the new students in the music group making new friends, and creating music together. One parent dropped her son off last week and turned to me and said, I love this place’.